Idakoos enables the creation of custom design T-shirts, Hoodies, Mugs, Tote Bags and Baby Bodysuits. London,, United Kingdom - - April 16, 2014 /MarketersMedia/ — Idakoos is a site that enables users to design and order their own custom designed clothing, the site claims to be one of the biggest online personalized product stores in the world. There are many benefits to a custom designed item of clothing, custom designed clothing items can make the wearer stand out from the crowd and help them express their own creativity. 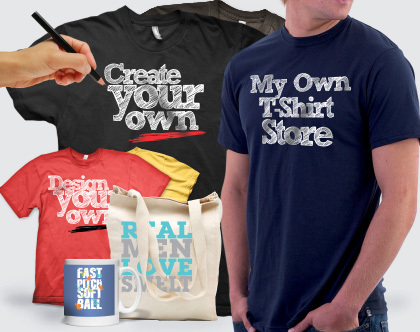 Businesses can use idakoos to create their own branded T-shirts, hoodies, aprons and promotional mugs. Self designed t-shirts are becoming increasingly popular for family reunions, school reunions, stag and hen parties, etc. the list of uses for self designed clothing is endless. For users that are lacking a bit of creativity the site offers many designs but they say they don't hold any finished products, each product the company sell is unique and made specially for the buyer. With just a few clicks a user can add a touch of themselves to any of more than 3 billion products. The site offers an endless number of themes for a user to produce their own, unique design from, it doesn't matter if a user is a sports fan, animal lover or if they want a t-shirt that will express their religious beliefs, idakoos has something a customizable design for everyone. A spokesperson for the site said that he believes the sheer number of design possibilities is what makes idakoos stand out from the crowd of numerous other “design your own t-shirt” websites. Users can also earn money buy selling their own designs on the site, idakoos enable a designer to earn a commission for each design that they sell in their own store, they can even choose how much they want to earn on each item. The company supply all the tools needed to create a site, they hold the stock, print and ship the items, all the user needs to do is create their store and supply the designs. More can be learned about the opportunities for users who want to sell their designs on this page.